What possible connection might we discover between the current concern about the Mayan Calendar, 2012, and the psychic readings by the American "seer," Edgar Cayce? 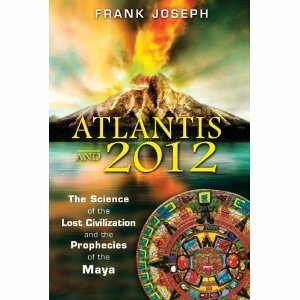 In his newest book, Atlantis and 2012 (Bear & Company, 2010), author Frank Joseph presents insightful observations about numerous connections between the lost, ancient civilizations often referenced by Cayce in his readings and the prophecies of the Maya and other ancient cultures around the world. Readers interested in the Mayan Calendar and Edgar Cayce will enjoy this book. Joseph's introductory chapter sets the historical basis for all further discussions in the book. He acknowledges the current concern with the "catastrophic scenario popularly associated with this soon-to-be experienced incident [of December 21, 2012]." Further chapters provide related details. He also explains the astronomical facts of the date that terminates the Mayan Calendar. "In the late morning of December 21, 2012, the ecliptic (the sun's apparent path across the sky) will intersect with the galactic ecliptic (the projection of the Milky Way's disc on the sky) to place the Sun at the very center, in the crosshairs between the solar path and that of our galaxy, when the Sun is one degree above the horizon at the equator (73 degrees West)." Now, from the perspective of us on Earth, this event happens "only once every 26,000 years." So what does this mean, or portend? That is where much disagreement currently occurs. Author Joseph begins his exploration of possibilities with other historical and pre-historical data. "The first day of the [Mayan] calendar's Long Count began in 3114 B.C." Joseph notes some intriguing parallel dates. "The first Egyptian dynasty was inaugurated around 3100 B.C." He begins, as well, to note various similarities between the Egyptian and Mesoamerican cultures. More importantly, he says, "Their similarities suggest an outside source that independently affected both." This leads to ancient prehistory and the legends of Atlantis and Lemuria, thereby setting up the first connection to Edgar Cayce and his psychic readings about those legendary places. Further chapters in the book provide the details, often based on new scientific and archaeological discoveries. Chapter One focuses on Greek philosopher Plato's account of Atlantis. Several points become important. The author reflects on a point that Plato makes, one that the author and Edgar Cayce will both emphasize, and that is the cause of the destruction of Atlantis and its relation to a lesson for humanity today. Plato makes the point that "human societies begin to self-destruct when their citizens no longer regard organic relationships between the spiritual and the material spheres of existence." Ultimately, "the consequences of cosmic disharmony reveal themselves in physical destruction." The author presents other interesting facts, many quite new. The Egyptian term for "Atlantis" was "Etelenty." A recent (2001) translation of "Etelenty" means "the land that has been divided and submerged by water." Anyone who studies world mythology will also learn that every culture in the world has a flood myth. New discoveries (1967) have found "elephant teeth from 40 different underwater locations along the Azores-Gibraltar Ridge" and these finds validate Plato's placement of Atlantis at that location. The next few chapters deal with other aspects of Atlantis, supported by linguistic analyses, known history, comparative symbols, and sacred numbers. Then connections between Atlantis and Mesoamerica begin to develop. One of the most amazing is a comparison of two carvings, one a fifth-century B.C. statue of Atlas from the Athenian Parthenon and part of the "Elgin Marbles" in the British Museum, and a relief carving inside the Temple of the Bearded Man at Chichen Itza's Ball Court in Mexico's Yucatan peninsula. They are nearly identical! How could this be? Mayan deities similar to the Greek god Atlas "were believed to have come to Chichen Itza just after a world-class deluge destroyed their capital across the sea . . . a homeland described as 'the Red and Black Land,'" matching Plato's "description of the red (tufa) and black (lava) natural formations on the island of Atlantis." The author presents example after example of parallels and connections between these two locations. He also builds a case for repeated cataclysms on the Earth as he references many new conclusions from recent research. For example, "A consensus of scientific opinion at Britain's Fitzwilliam College in Cambridge during the summer of 1997, found that our planet had been subjected to a set of celestial bombardments beginning more than 5,000 years ago." If we get out our calculators, we just might notice that 2000 (2011) plus 3100 (3114) adds up to approximately 5,000 years! The author presents evidence from cultures around the Earth, all of which have records of various cataclysms at nearly identical times. Amongst all such data, we find that a message prevails: "the delicate balance between [mankind's] behavior and cosmic judgment." Further chapters in Part One of the book focus on various factors related to 2012. The author notes that the Maya believed that "coming events were foreshadowed in the past," something that modern people might identify as natural cycles. Consequently, Joseph discusses how the Maya documented observations of past events, as did many native cultures around the world. He includes, as well, much current scientific research, such as the cyclic nature of ice ages. Russian researchers at the Russian Academy of Natural Sciences predict a "little ice age . . .by the mid 21st century." Scientists in India predict "increasing volcanoes, tectonic movements, earthquakes and landslides." Geophysicists at the U.S. National Academy of Sciences are concerned "that a super solar storm could catastrophically effect our world during 2012." Certainly all the data available about cataclysms of long ago and the potential for similar events in the present times, is enough to cause great concern. Within the context of Frank Joseph's book, the discussion leads very naturally to the second half of his work entitled, "The Seer." The "seer" is, of course, Edgar Cayce, often called the "Sleeping Prophet" because all of his "readings" came from a deep trance-state. Most of his early "readings" involved medical diagnoses for thousands of clients." All of his readings were stenographically recorded, and they have been thoroughly studied and researched by medical doctors over many years. Cayce has sometimes been called "the father of alternative medicine." Later, in the 1920's Cayce began to give "life readings" that involved "past lives," sometimes from the time of the legendary Atlantis and Lemuria. He did 14,256 life readings for some 8,000 clients over a 43-year period. Edgar Cayce died in 1945. A good part of Frank Joseph's chapters on Edgar Cayce apply research and discoveries that evolved in the years following Cayce's death, all of which corroborate and bring further light to his "readings" and predictions. For example, Cayce discussed the Essenes many years before the discovery of the Qumran community remains. Cayce said in a 1930's reading that the Nile River flowed across the Sahara Desert to the ocean in Atlantean times. In 1994 a satellite survey confirmed that a former tributary of the Nile "connected Egypt to the Atlantic Ocean at Morocco." One part of Cayce's story of Atlantis was considered complete fantasy for many years. He claimed that Atlantis had a high level of technology, especially involving the use of quartz crystal electronic technology. "None of this made scientific sense in the 1930s . . . until the advent of the crystalline silicon chip nearly 50 years later." This, of course, was the technology that led to our current computer age. Cayce also predicted a "super cosmic ray that will be found in the next twenty years." Then "lasers were invented [or reinvented] around 1960." The author also discusses the fascinating folk history of the Americas where nearly every native group's folk memories "are replete with [stories] also describing the arrival of flood survivors from both Mu [Lemuria] and Atlantis." One story, of special interest to me (who has Cornish copper mine engineer ancestors) is of pre-historic mining in the Upper Peninsula of Michigan. Plato had described the Atlanteans as "great miners and metal-smiths." Their specialty was a superior bronze called orichalcum. Until last year I had never heard of "America's greatest archaeological enigma: the excavation of at least half a billion pounds of copper ore in a stupendous mining enterprise that began suddenly in the Upper Great Lakes region of the Michigan peninsula about 5,000 years ago. . . . Menomonee Indian tradition remembers [the miners] as the Marine Men, white-skinned bearded foreigners who sailed out of the East." Cayce's readings about the long-lost Atlantis tell of two rival factions from that time: the Children of the Laws of One who honored natural law, emphasizing healing and spiritual values, opposed by the Sons of Belial who "were interested in using natural resources only for their own material gain." Thematic to both Plato and Cayce is the idea that the destruction of Atlantis was precipitated by greed and misuse of technology. Author Frank Joseph emphasizes that the story of Atlantis uncannily resembles "the present condition of world civilization." Frank Joseph's Atlantis and 2012 presents thoughtful insights to readers. Much easier to read than many of the rather technical books on the Mayan Calendar, this work provides much food for thought for readers concerned about 2012. Moreover, it delights fans of Edgar Cayce with its many corroborating results from recent studies and explorations. The author's idea to coordinate a discussion of the Mayan Calendar, 2010, and Edgar Cayce results in a fascinating book for readers. To order Atlantis and 2012 from Amazon.com, click here!